Hello! We are Antoine Berr and Carlos Santana, industrial design students from ENSCI–Les Ateliers. For the last two years, our almost daily challenge was to help our vegetal comrades to fulfill their natural necessity for water, sunlight, nourishment and heat. The conditions for their development weren't always obtained that easily: different plants have different needs, and different places can provide a wide range of different environments. 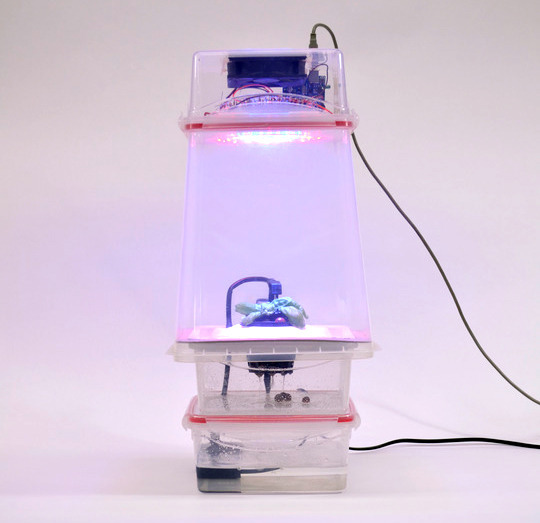 Biobot is an interactive connected greenhouse. 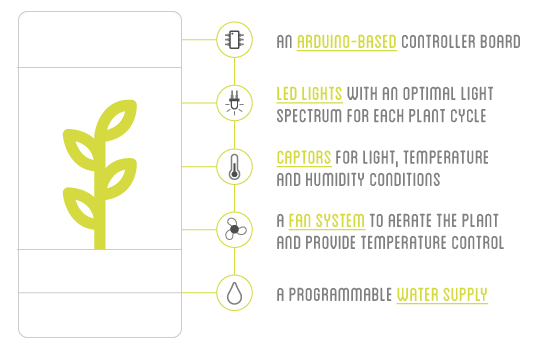 Our idea is to use Arduino to manage the evolution of a plant: first by automatically providing it with water supply, light cycles and ventilation, and later by placing captors to feed their temperature, humidity and light measurements to an online app. This way, Biobot will be able to control the plant's environmental conditions by compensating for eventual changes in these parameters, and keep you informed everywhere you go. 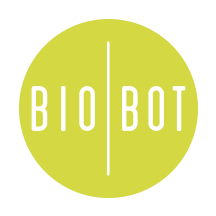 Our goal is to better understand and participate of the life of our plants by getting connected to them: we want to use Biobot to keep an eye on their habitat all day long in order to make sure they are having the best condition for their development – while having an awesome time. First of all, the basics: water. You'll need a container just big enough to house a couple of litres in order to feed the plant, as well as some empty space over the top of it to accommodate the roots. You'll also need a small pump to get the liquid flowing and irrigate our friend. Then all you'll have to do is to place a grow tray on the top of the container, introduce our mate to its new home and we are ready to go! We're not ashamed to say that for us the cover is the part that matters most: it is a luxurious automated house that offers your plant a nice panoramic view to your place and provide it with all the light, heating and aeration it needs... that goes without saying, with an Arduino board that will manage all of this technological goodness. In three words.. PLUG AND PLAY! 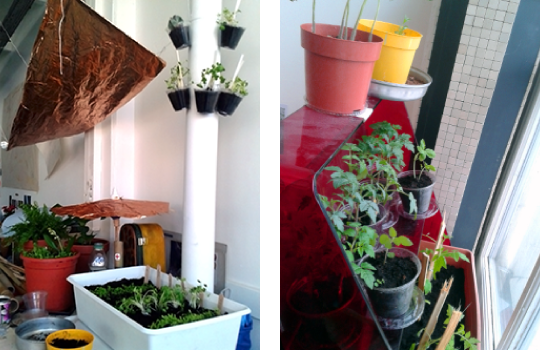 Everything began in 2012, at ENSCI's Plateau du 4. As we were working on a hiking project from the middle of Paris, it became clear to us and to our colleagues that we had no choice but to find a way to be surrounded by nature in order to extract us from the city and to project ourselves into the mountains. 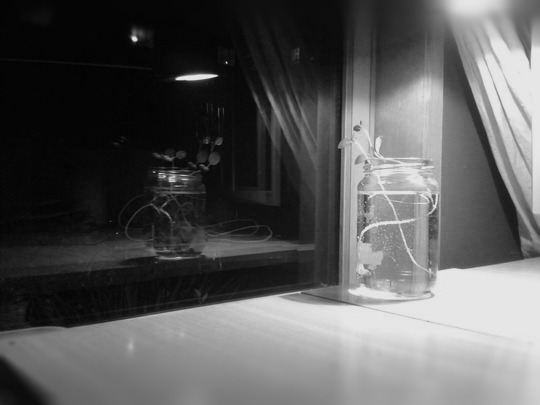 That's why we began to grow some seeds... And after a couple of weeks of pure love and devotion, we were dazzled to see that our first plants were coming into this world – in the heart of a design school. As these new living beings joined our team and became our buddies, it was our utmost responsibility to offer them the best possible way to grow and flourish as they deserved. We soon had to settle them in a larger flat (a tough one in Paris, trust us), and quickly they could become independent. We had to rearrange our workspace to make sure each one of them was getting as most sunlight as possible. By the end of this adventure, we moved to southern France in order to take part of the ENSCI atelier located at MINATEC's IDEAs Lab, a part of the CEA Grenoble campus. Last winter was particularly harsh in the French alps, and we were happy to see the first of the spring's warm sun – but surely not as much as our plants. They finally woke up from their sleep and soon started shaping up for spring! 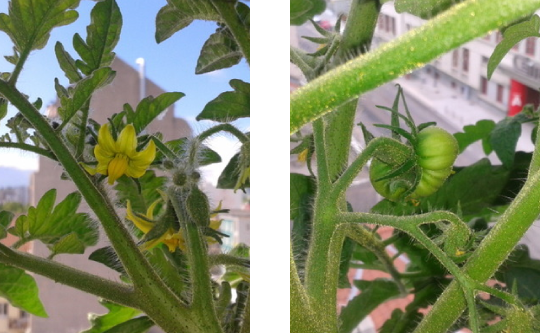 Following the cycle of life, Pachamama this time had a gift for us: she gave us flowers, that soon turned into delicious strawberries and tomatoes. Our long dedication finally paid back! We had to come back to Paris by the end of the semester, and it was really complicated to bring all of them with us (we are talking about six 3'5" tomato plants, as well as a bunch of strawberries and multiple aromatic herbs). We chose to leave most of them in the expert hands of Nathalie and Stéphanie (they will surely recognize themselves!) and finish our Isèrean stay at the Jardin des Cairns, over the slopes of the Bastille. Now back to the City of Light, it's all melancholy and sadness as we're back in our tiny dark apartments... and as we watch our friends struggle to survive without the fresh air from the mountains. Winter came, and we noticed it was going to be impossible for our buddies to make it because of the reduced sunlight and low temperatures. But we're not the kind of people that give up... that's why we're back to work! We're starting from scratch, bundling together an irrigation system, a lighting equipment and a plant. Our goal couldn't be more simple: in the end of it all, we just want to cut our plants, plug them, admire their growth, watch their flowers bloom, harvest their fruits and replant. Every piece of plant is good enough, and the whole world is our database! 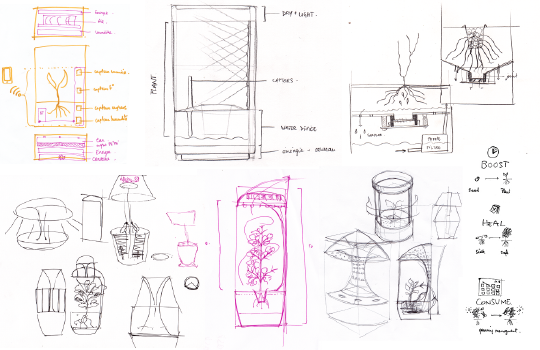 But in order to do this seamlessly, we still have a lot of work until we completely control the plant's environment using Arduino and a bunch of captors. And that's why we need your help. Three months ago, all we had was an idea. Today, after lots of little or no sleep and a good bit of consistent mindfuck, we have produced a first low-cost proof of concept that represents the progression of our design process. 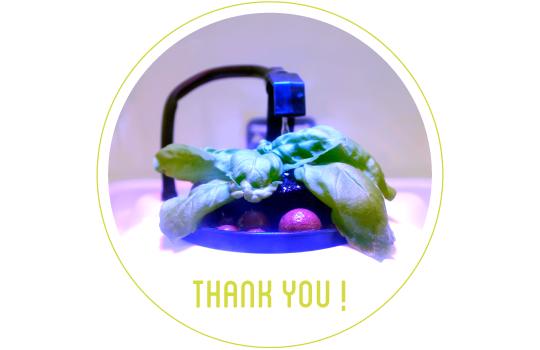 For the next thirty days, we'll show you the life of our little basil friend Tobbia, and will take care of her using our first prototype. We'll keep working on it, and you'll be kept posted of our latest findings and developments. 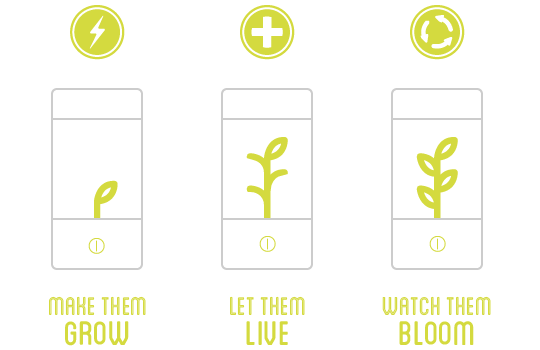 We will share the life of this little plant with you: during the next 30 days, join us in the wonderful act of taking care of a living being,by providing the best possible conditions for sustaining its life using Arduino-controlled components. You're invited to get in touch. We'd love to hear back and to exchange ideas with you. Together, we hope to achieve the production of functional prototypes that will consider your needs and integrate your collaborations. By summer 2014, we want to build up to ten functional prototypes that will work independently and communicate to a mobile interface. 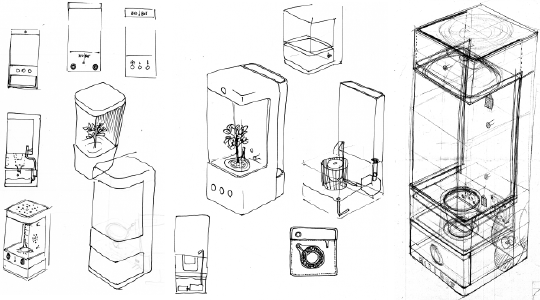 We need your help to finance the production of these prototypes, and most of all, we invite you to take part in our adventure by getting one of them and testing it with your own plant. This way, we'll be able to know more about the growing conditions of different kinds of plants in a wider range of environments, and push the development of Biobot further and further. 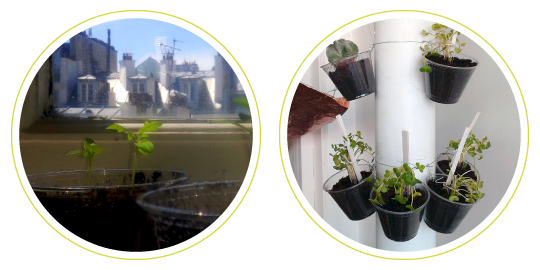 We think everybody should be able to take care of a living being, and by using widely available components each one of us could build a tool to follow the life of a little or large plant using open hardware. That's why we have been putting all of our efforts to make our plant live and bloom with our system, and we want to share its development with you. You'll be able to get the schemas needed to build one basic unit, using parts that can be found online or at a nearby shop. 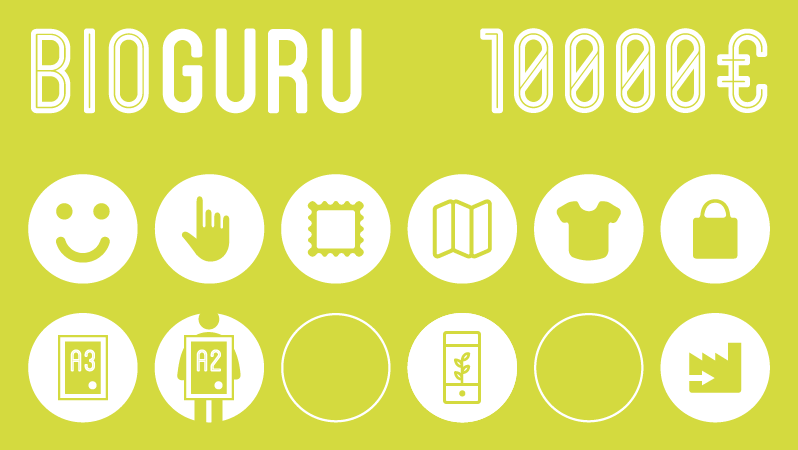 After building them, we'd love to hear from you as you hack, tweak and tinker our concept. This way, we'll make this dream grow bigger and bigger. This honorable mission motivated one of our friends... but not any friend: the philosophical engineer Maximilien Daman is our man for the development of the final circuit boards and thermal exchange researches that will make our greenhouse work at its best. 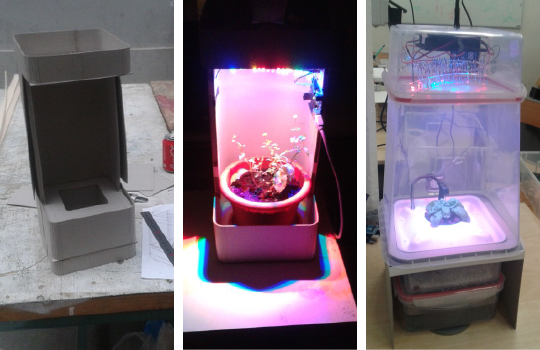 For now, it has been a month since we started working on the intensity, spectrums, voltage and controlling of the LED lights... and we're thrilled with each little improvement, as it represents one more step towards seeing Biobot take form! With all this work in progress, we want you to imagine and develop this project with us. Next steps are installing the captors, controlling the whole system and making it feed live data: this way our plants will finally be given voice, and we'll be able to listen as they tell us exactly what they need. This crowdfunding campaign is also YOURS, as we want you to live this adventure and overcome each one of its challenges with us. The more of you are by our side, the more we'll be able to exceed and push our project further. 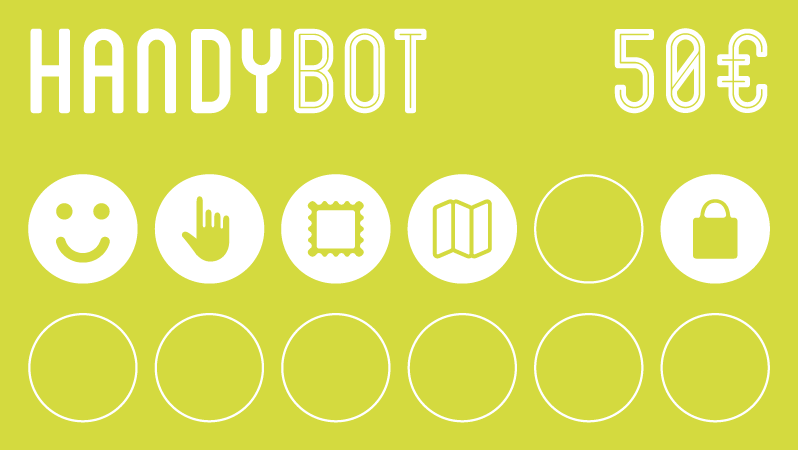 The Biobot that will come to life by the end of these thirty days will be the one that some of you will be able to get! Now all you have to do is to get in touch, share your ideas, spread the word, follow our findings, coach our development and JOIN US! 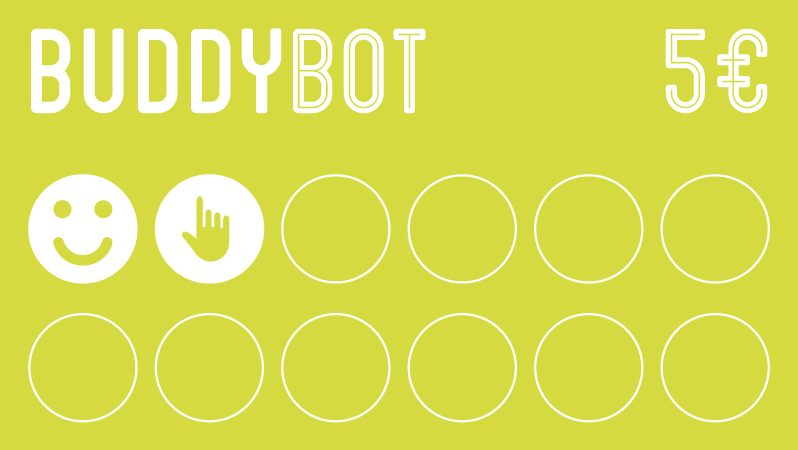 BUDDYBOT • You'll get your name eternally carved in our website, as well as future updates about the project through our newsletter. 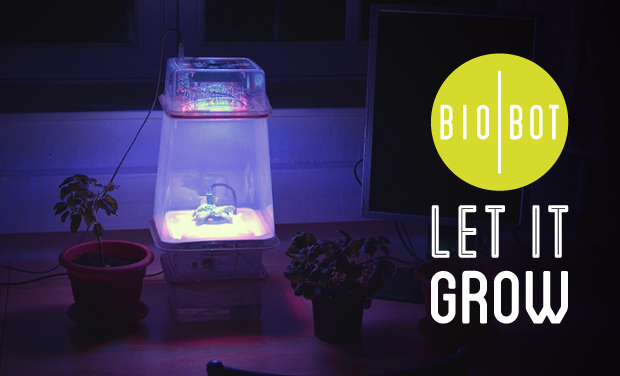 And of course, a great big THANK YOU from us for believing in Biobot and for making the growvolution become reality! 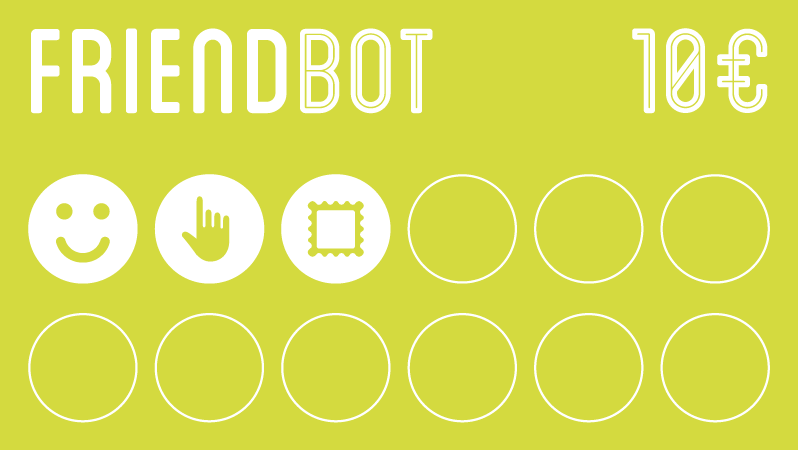 FRIENDBOT • Your name will be listed on our website forever, we'll keep you timely posted about all of our wicked discoveries AND we'll send you our great big THANK YOU by mail on a nicely-done postcard, handwritten and signed by us! 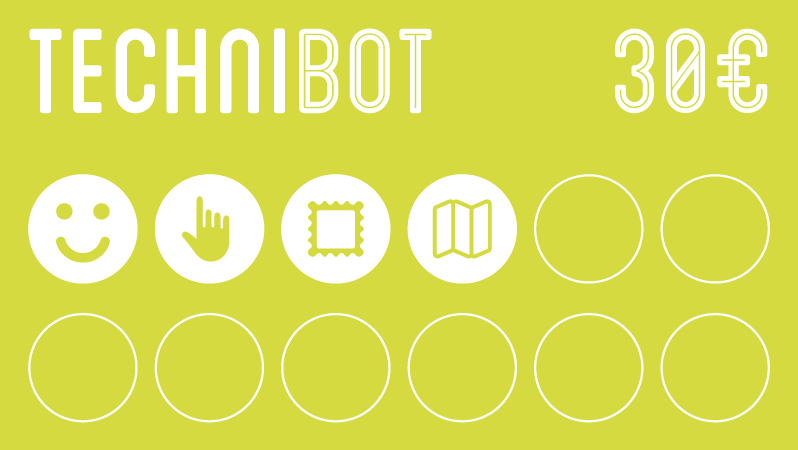 TECHNIBOT • Do you want to join our adventure by building your own Biobot? Get access to the documentation, schemas and component lists needed to assemble a basic prototype! Tweak it as you like, share your own findings with your biobotter peers in our discussion group AND get our handwritten THANK YOU postcard by mail! WEARABOT • Show your support to our project by wearing one of our stylish t-shirts AND, obviously, also receive all of the above gifts – as well as a huge THANK YOU! HANDYBOT • Take the growvolution everywhere you go with a beautiful 16L tote bag made of 100% fair trade organic cotton! 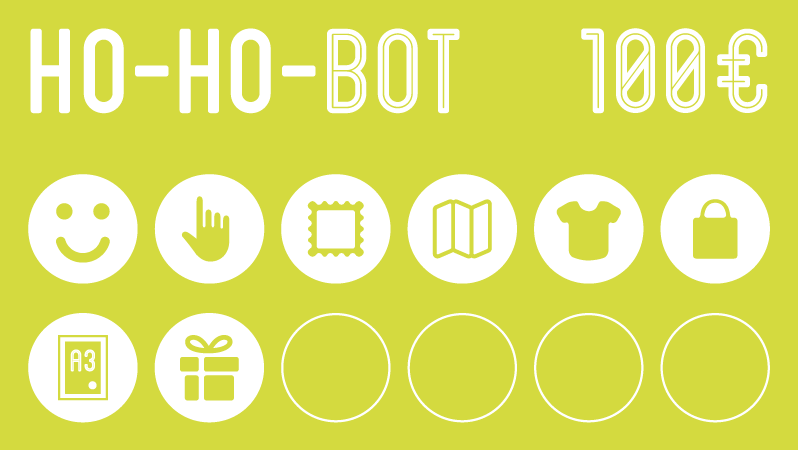 You'll also get the TECHNIBOT gift pack – as well as an even huger THANK YOU! 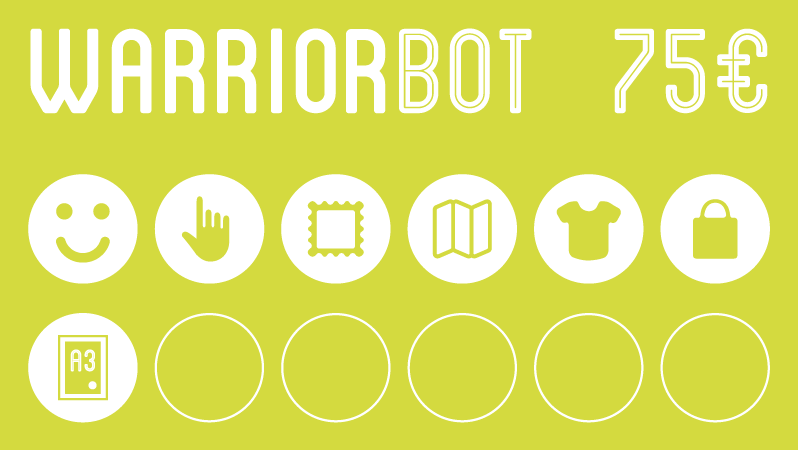 WARRIORBOT • Can't decide between the t-shirt or the tote bag? It's simple: get them both! And as to compensate you for being such an indecisive person, we'll also ship an A3 poster for you to tweak your walls or spread the word – as well as a mega THANK YOU and a bunch of good vibrations! 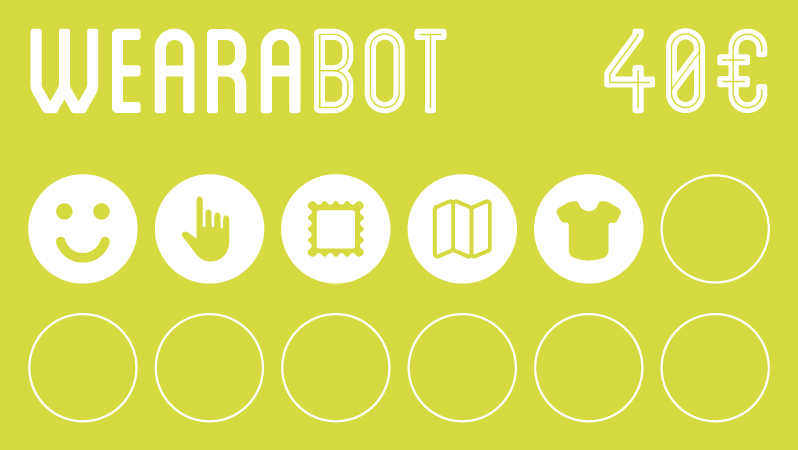 HO-HO-BOT • Feeling generous these days? Looking for an early (or late) holiday gift for someone special or for yourself? We'll ship you the WARRIORBOT pack binded with a gift of your choice: either a t-shirt locally grown in Paris by TEALER (@wearetealer) or one of our limited-edition screen printed A2 posters, signed and numbered – as well as an über THANK YOU and infinite good karma! 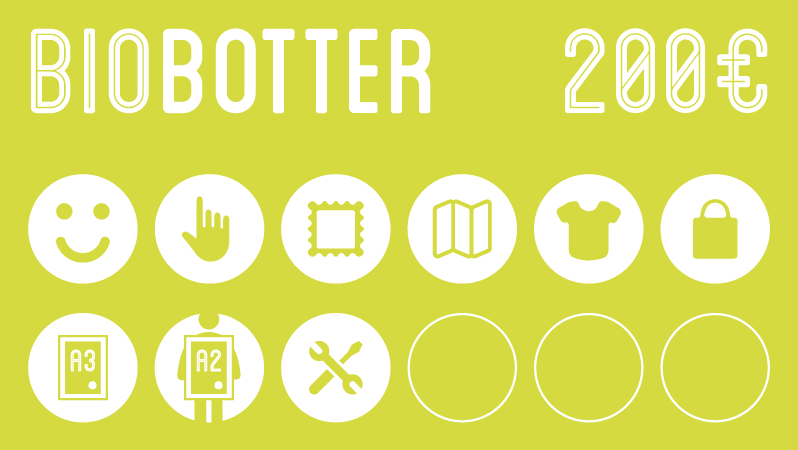 BIOBOTTER • Are you ready to join us by becoming a fellow biobotter? 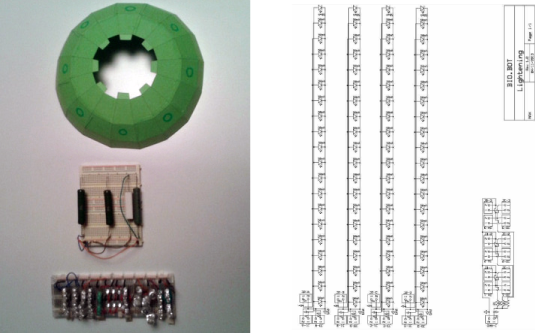 Take your engagement to the next level and assemble your own prototype! We'll send you a kit with all the construction parts, the electronic components and captors, as well as the controller board and the application. In exchange, you will be able to help us by testing our system with a number of different plants and environments, making us more than glad to hear back from you on how and with what kind of plant you are using it, as well as the results you're getting. As you'll become a part of the experiment, you are going to have a direct contact with us: we will keep you posted on the development of our project and will always be nearby to guide and to be guided by you through this adventure. You'll also be able to peep on Tobbia through a 24h webcam (ssh!) and to meet us live [if you're in the Parisian region]... and that's not all! You'll also get the WARRIORBOT pack, a limited-edition A2 poster and a THANK YOU full of love from the deep bottom of our hearts! 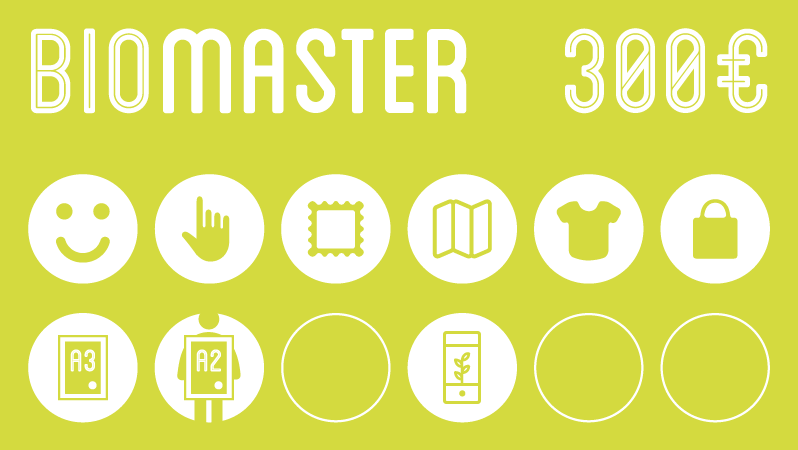 BIOMASTER • In the case you have a green thumb but puzzles make your head melt... don't worry! All you'll have to do is to become the commander of our ship by getting this pack – we'll get everything done for you! You'll receive the BIOBOTTER pack with an assembled prototype that will be yours to plug and experiment as you like, without hassle. You'll also receive an out-of-this-world THANK YOU from us and from our future descendants, until the second degree. Guaranteed! 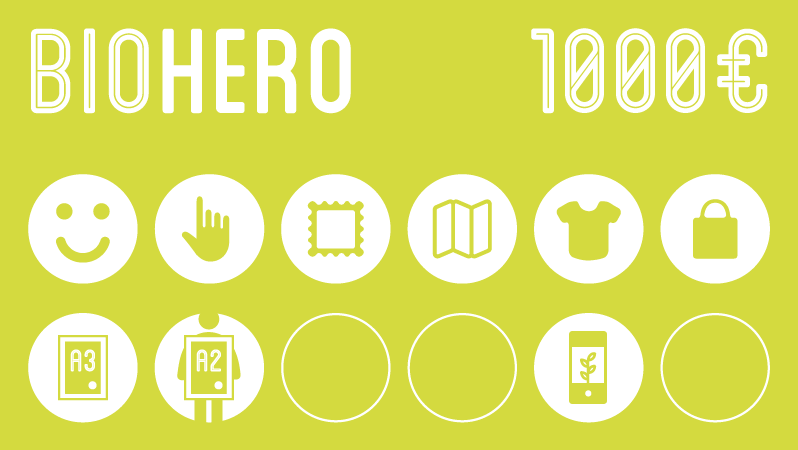 BIOHERO • Become our first hour hero! To reward you for such a bold and fearless gesture, we'll send you an unique and customized prototype, using first-class material and developed with your tastes in mind. You receive our gifts galore directly from our hands, bundled with one of Tobbia's seedlings (with an authentic birth certificate) and an afternoon of discussion with you in the place of your choice! [transportation costs to be added if you're not in France or bordering countries]. That goes without saying, as we'll THANK YOU in person, you and your family will be able to feel our gratitude by seeing a poetical shine glaring from our eyes.